Or is she just off her meds? 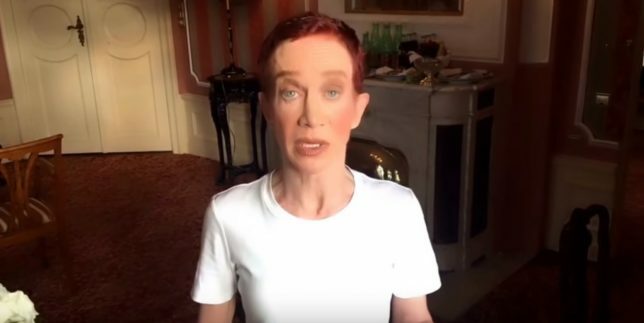 After watching Kathy Griffin’s latest YouTube video, I have to wonder if she is certifiable. Back in May she sent her career into a nosedive after posing for a photo holding up the fake, decapitated head of President Donald Trump. In an attempt to save said career, she held a press conference that quickly turned into a pathetic rant. It did not revive this career of hers, at least here in the U.S. A few weeks ago, she posted a rant on YouTube blaming loads of people in the entertainment industry for her downfall. Again, her moribund career was not revived. And this week she released another rant. On the off chance you don’t know what the definition of insanity is, go here, and it will quickly become apparent why I question Griffin’s mental health. Here’s hoping it is merely a case of Griffin misplacing her Thorazine. Anyway, in her latest diatribe, she bounces from the topics of feminism, to how much she has done for the LGBT movement, to why Lena Dunham is hurting the movement, to her current world tour, to how her legal bills mean she can’t donate money to another cause being promoted by Norman Lear (He’s still alive? — The Wife), to how no other woman in American history has ever endured the wall of crap she’s had to, to how she has no shows booked in the U.S. when she gets back from her world tour. Yes, she fantasizes some sinister cabal has her name on a list, and that list goes out to every major theater in the United States. There can be absolutely no other reason she has no U.S. dates. Well, maybe there is one. In her previous YouTube rant, she ripped into everyone who had previously helped with her career. Here’s a thought: If your career is in the crapper, perhaps it’s not a good idea to burn bridges with people who might be able to pull it out of said crapper? Oh, and now that I think about it, there is one other possible reason Griffin has no U.S. shows. Maybe, just maybe, after pulling one of the stupidest and most offensive publicity stunts of the last decade, Griffin is to selling tickets what Dr. Kevorkian was to his patients.